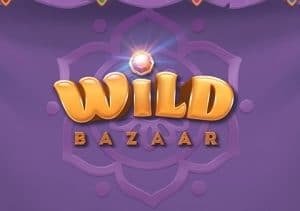 Take a trip to a bustling Arabian market in Wild Bazaar, an exciting 5 reel, 26 payline video slot. The likeliest way to bag yourself a bargain in this NetEnt powered game is via the respins which come with stacked, colossal, linked and multiplier wilds. Play on your PC, tablet or mobile from between 20p and £400 per spin. NetEnt video slots are usually easy on the eye and Wild Bazaar is no exception. The setting here is a stall at a souk on a dusty street. The reels feature 4 jewellery symbols. Each of these comes with a tag of up to 2 times your bet if you land 5 on the same payline. Stacked Wilds feature – land 3, 4 or 5 of the red treasure chest to trigger the stacked wilds. These expanded wild symbols all spin in 4-high stacks. Colossal Wilds feature – giant 2×2 wilds are in play if you trigger the respins with a winner made up of the green treasure chest. Linked Wilds feature – if 2 wilds land on the same row, all of the symbols in between the leftmost and rightmost wilds will also turn wild. If this is reels 1 and 5 you could land a terrific chain of wilds. It’s the purple chests that activate this round of respins. 2x Multiplier Wilds feature – the blue chest unlocks this modifier. Land a winner during your respins that includes a wild and the payout is doubled courtesy of a 2x multiplier. We found plenty to enjoy in Wild Bazaar. The visuals are as good as ever and the Arabian inflected backing track adds to the atmosphere. There’s nothing revolutionary about the wild extras on offer here. When all packaged together they work very well though and deliver plenty of action. Combine the high-class design with a good range of extras and an excursion to the Wild Bazaar is recommended. With wins of up to 390 times your bet on each respin with a 2x multiplier, it’s a low to medium variance offering. If you want something offering more substantial payouts, Playtech’s Treasures of the Lamps is recommended. T&Cs Apply 18+. New Customers only. Deposit and wager £10 within 7 days of opening new account. £70 bonus = 1x £10 Free Sports Bet, 2x £20 + 2x £10 Casino Bonuses for selected games with up to 60x wagering applicable. 3 day expiry. Credit and Debit cards only. Geographical Restrictions and T&Cs Apply. Please Gamble Responsibly.